This post brought to you by Glad & M&M’S®. The content and opinions expressed below are that of Smart School House. I just adore holiday cooking, don’t you? Today’s extra special recipe is perfect for all Santa lovers (which pretty much sums up all of us!). Santa is a pretty busy guy, so he needs to snack whenever he gets a chance. 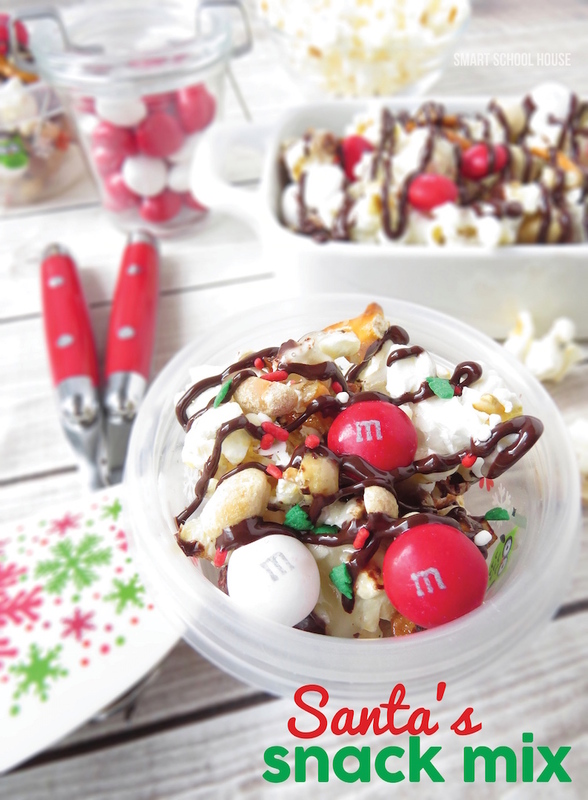 Santa’s Snack Mix is the funnest holiday treat we’ve made in awhile. I know you’ll love it too! To make Santa’s Snack Mix you need a couple of essential (easy to find) ingredients. 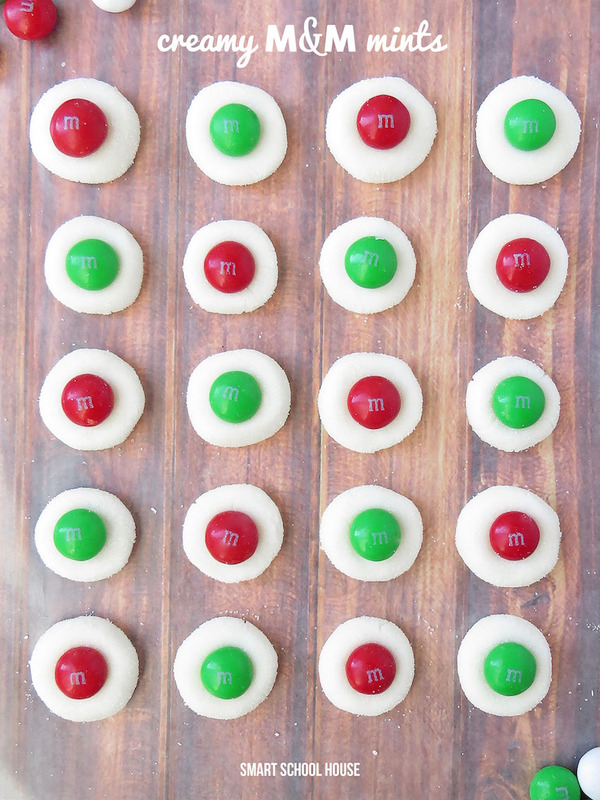 First things first, you’ll need some M&M Holiday Mint Candies available at Target. 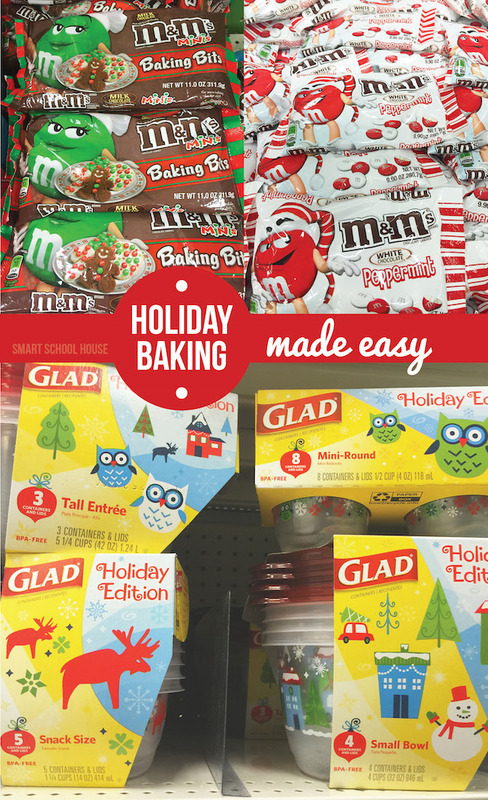 While you’re there, be sure to grab GLAD’s Holiday Edition Mini-Round containers (they are so cute!). In just a few minutes, you will whip up a treat to feed a whole party, office, or class! In a bowl, combine the popcorn, pretzels, ad peanuts. Set aside. In a small saucepan, melt butter, vanilla, sugar and corn syrup over low heat until melted and smooth, stirring constantly. Pour over the ingredients in the bowl and toss until all covered. Spread the popcorn mix on a baking tray or cake pan (may want to use two pans). Bake for 15 minutes. Remove from oven. Decorate with 1/2 cup of holiday sprinkles and stir. Sprinkle with M&M candies and stir again. Place DOVE chocolates in a small microwave safe bowl. Heat for 30 seconds and stir. Repeat until melted and smooth. Drizzle over the popcorn. Decorate with remaining sprinkles. Let cool for about 10-20 minutes. Once cool break into chunks. Store in GLAD containers. Serve to friends & family! You can find everything you need for this easy holiday treat exclusively at Target (I love easy to find ingredients!). The GLAD containers are so festive and so perfect if you plan on sharing holiday goodies with others this Christmas. Who doesn’t love pretty packages at Christmas? Santa’s Snack Mix will stay fresh and yummy in these adorable little containers found at Target. 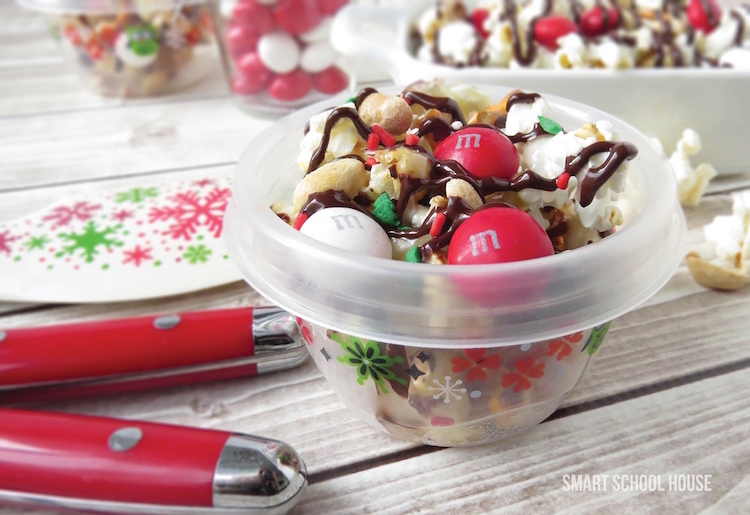 If you love M&M’s as much as I do, you’ll LOVE our recipe for Creamy (melt-in-your-mouth) M&M Mints. CLICK HERE for the easy no-bake recipe!